“The city has passed the bread and butter stages and reached the intellectual zone of civilization,” The Eagle proclaimed when the library opened in 1915. 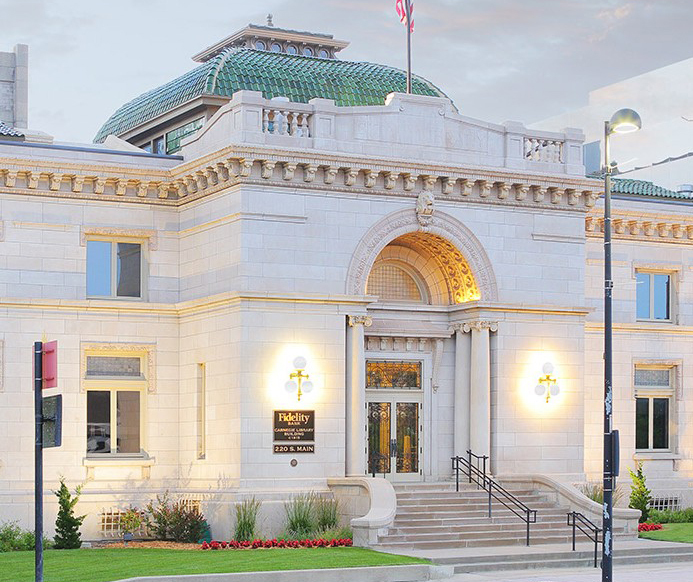 Beginning May 14 – when the first book was officially checked out a century ago – Fidelity Bank officials plan to celebrate the building and host centennial events later this fall. Those events will include concerts in the pocket park near the building and an open house so the public can tour the building, which is owned by Fidelity. “Not only was it Wichita’s first library building, it first doubled as a building for art exhibitions,” said Clark Bastian, Fidelity Bank chairman and CEO. In recognition of its historic importance, Bastian said last week that the building’s exterior letters of “CITY LIBRARY” above the arched entrance will be outlined and painted in gold leaf. The paint will be applied within the next few weeks and is expected to last for up to 30 years. For half a century, the building was a library. It later became a municipal court building and then the Wichita Omnisphere and Science Center. Now it is the commercial bankers division of Fidelity Bank. It is not open to the public. In some ways, the building stands in tribute to Wichita’s first interior decorator, Louise Caldwell Murdock, who studied in New York and was determined to bring art and culture to Wichita. She selected the furniture, sunflower windows and lighting, according to an article in the March 1916 edition of the New Ladies Home Journal. Unfortunately, Caldwell Murdock – who helped found the 20th Century Club and left a trust fund for art that became the beginnings of the Wichita Art Museum – died on April 23, 1915, a few weeks before the Carnegie Library opened on May 14, 1915. “The building, when it opened, was a historical event for citizens of Wichita,” Bastian said. “Wichitans were proud of this building, and this was a new cultural asset for the city. In its heyday, the library was one of nearly five dozen Carnegie-funded libraries built in Kansas. Of that number, less than half remain today. The building was placed on the National Register of Historic Places in 1987. As it changed from a library to a municipal building to a science museum, the building underwent a series of changes. Through each change, ceilings were altered and original stained-glass windows, chandeliers, murals, marble columns and portions of two floors were removed. When Clark and Clay Bastian – brothers and officers at Fidelity Bank – saw the building in 2006, it was drastically altered from the building Clark Bastian remembered going to as a boy to check out books. The brothers, who were looking for office space, researched and painstakingly restored the building to much of its original grandeur. Fidelity Bank moved its offices into the building in May 2009. And Clark Bastian’s office is now in the corner of the building where the library’s children’s room was once located. When it was originally opened in 1915, the Wichita Carnegie Library marked the beginning of Wichita's cultural renaissance. Far more than a structure to house books, the library gave visitors the feeling that they were entering a cathedral to learning, fine art and cultural ideals. Now fully-restored, the Carnegie houses Fidelity Bank’s commercial banking division.